Hello, and TGIF! Everyone looking forward to the weekend. And the weather is supposed to break here and we are supposed to have lower humidity, YEAH! Today's card is for the "Other Theme Challenge" at Crafters Digital Art Center (link on the right). 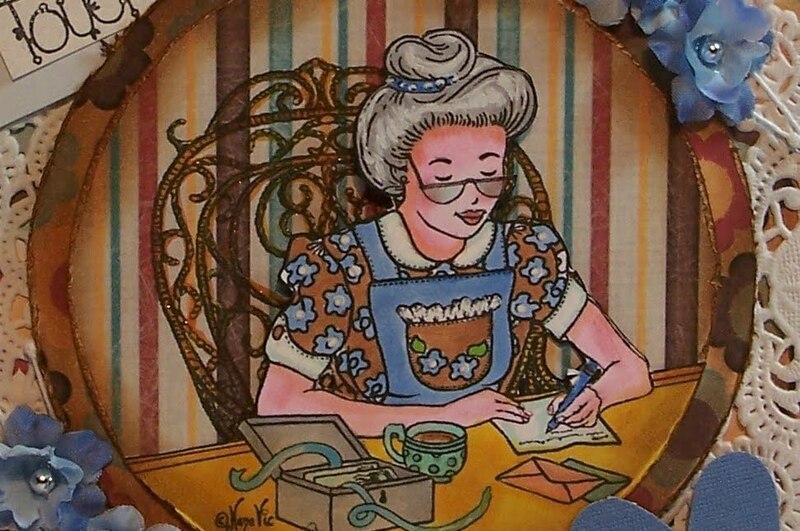 This is a free digital image that is being offered by Nana Vics Digitals this challenge and the challenge is "Make it old". I used papers from My Mind's Eye and distressed all the edges and inked them distress ink. I colored the image with Copics. I printed it on white card stock and on a printed card stock that I wanted to use for the background. After I colored the image, I cut it out and glued it on top of the one I printed on DP. I used a dimensional to pop her out a little so it looks like she is sitting forward. The flowers are from a silk bunch that I dismantled. The small envies are from my stash. The sentiment is an old stamp from DOTS (Now Close to My Heart). Wow...I have never seen this beautiful image! It is gorgeous Sue! You coloured it beautifully..lots of detail on this image, so it must have been very tricky...but totally worth it! Ohhh wowwww Sue,what a beautiful card<I love the image and the colours. Sue, that is such an adorable card. Love the background and the colouring. love the paper and the image, your coloring is great. Your card is gorgeous Sue. I love the image and the lace border! 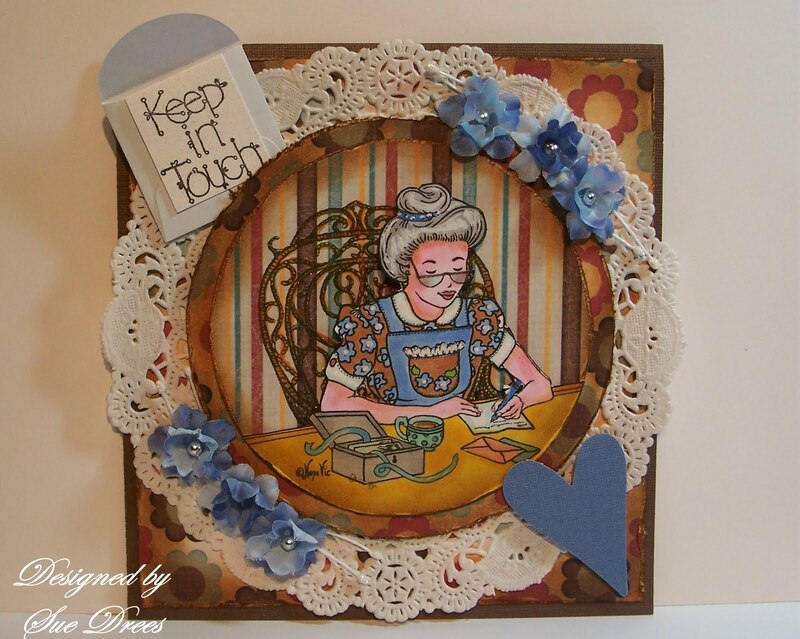 Your card is stunning and I was so happy to see that it Spotlighted over at CDAC! I wondered how you had created the background and wasn't sure it you masked the image or printed it twice! Now I know and it worked out perfect! You've done a fab job of featuring this digi stamp -- everything about it is perfect.